Built in the 1840's, this home boasts the original butternut woodworking and stained glass. 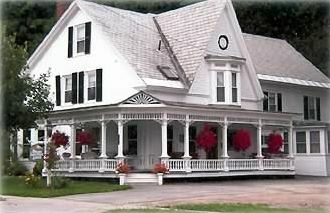 Ran as an inn for 40 years, this property is decorated magnificently - not your average vacation rental. With ten bedrooms, each with private bathroom, groups can enjoy vacationing together without giving up their privacy. The large living room with fireplace and two sitting areas is large enough to make everyone comfortable, as is the dining room that seats 16. The property also has a fully-equipped, eat-in kitchen and laundry room with washer and two dryers. Not to mention a 'hang-out' room for the kids. Best of all, the Okemo shuttle stops right at the front door. Located just across the street from the local country store, and a short walk to the village bakery. This home is a perfect rental for groups or families travelling together. We absolutely loved this house! It's such a beautiful, charming victorian! Each room is decorated beautifully. Our kids just love the third floor and there is so much space for large families. The owners are SO nice and easy to deal with although we had no problems, they were available to us if need be. It's right across the street from a really cool store called Singleton's so it's very convenient and a short drive to the mountain if you are skiing. We will definitely stay here again! Thank you so much for the fantastic review. We are so happy you all enjoyed our home last winter. We look forward to your family coming to Vermont again soon! Our first time up to Okemo I was coordinating a huge group and had tons of question for the owners of this house, who were great to deal with. Love it to much have ended up going three times, once in the Fall and twice for skiing...going up again this winter! Location is great, quick ride into town or to the mountain...A fantastic home for families or adult groups...It's clean, tons of bathrooms and a big area to eat in...two different living areas in the house, so you can have separate hang out areas which works great with our group. Thank you Christine for the lovely review! We are so happy you have vacationed at our home over the years and love that your crew is returning. We will do our best to make it enjoyable!! What fun! A perfect place for a family get togther. We go on ski weekend and have rented this place for the last 2 years. Everyone gets to stay togther with their own bathrooms! Right across from the general store and close to Okemo and Kilington. On the ski shuttle run for Okemo. Good base for sightseeing. Enough to do for everyone and one of the biggest kitchen/breakfast areas I have ever seen. Kim, I'm sorry I never thanked you for your great review. It was so nice of you to take the time to do that. We hope your group has manymore fun get-togethers wherever they may be!! Cheers. This is a seasonal rental. Renters are responsible for heat, snow removal, trash removal, Will supply sheets.